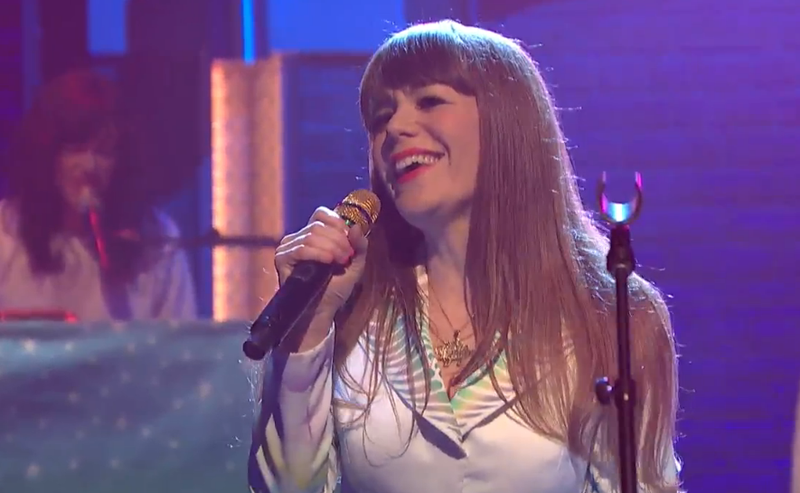 Jenny Lewis—former frontwoman of Rilo Kiley and patron saint of the perfect bangs—brought her laid-back '70s-style jam "She's Not Me" to Late Night with Seth Meyers last night. The performance was effortless, with Lewis (dressed in her now-signature "graffiti Gram Parsons" suit) owning the room with a confident strut and near pitch-perfect vocals. Lewis' Lisa Frank-esque Nudie suit, which she wore on both her album cover and in the video for "One of the Guys," was conceptualized by famous L.A. airbrush artist Adam Siegel (he also painted her guitar and set pieces). Lewis has committed to wearing different versions of the suit for her entire tour.